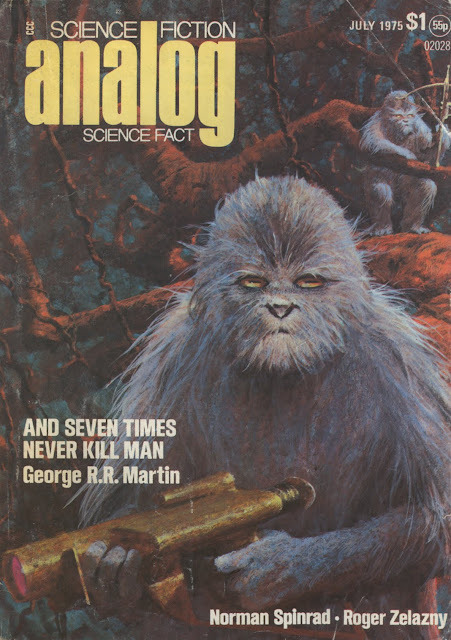 I remember seeing this cover somewhere before years ago, & I always wondered if this image had any influence on the look of Chewbacca in the first Star Wars movie. Looking at Ralph McQuarrie's initial sketches which were miles from the final version, it's almost as if George Lucas dropped a copy of this on McQuarrie's desk & said.."I want it like that.."
I've got a few SF art books that cite this image as 'the' Chewbacca/Wookiee inspiration, but there's nothing official said about it. This mag has a couple of interior illustrations which feature the creatures wielding weapons that look a lot like the Bowcaster that Chewbacca uses in the Star Wars films, I think it's too much of a coincidence to be an accidental likeness. It reminds me of the story in which it is suggested that the Naboo city from 'Phantom Menace' was ripped off of James Gurney's Dinotopia illustrations, but that he simply wasn't in a position to take on Lucasfilm & make an issue of it, even tho (apparantly) the resemblance is pretty damning. John Schoenherr is one of the greats. I understand he might still be painting, - albiet now doing non-commercial/non-illustration nature artworks. How insane is the quality of the authors and stories Analog had in the 60's and 70's? - loved the Cloak and Staff series. "George also gave me a drawing he liked from a 1930s illustrator of science fiction that showed a big, apelike, furry beast with a row of female breasts down its chest. So I took the breasts off and added a bandolier and ammunition and weapons, and changed its face so it looked somewhat more like the final character, and I left it at that." He's referring to a drawing from inside the magazine in fact. I'm writing a little thing for my blog on it, I'll drop a link here when it's up. Cool, I'd be interested to read that, Michael. John Schoenherr died earlier this year. Truly one of the best illustrators to every grace the SF field. I took a look at this earlier, & it was indeed a fascinating read. However, when I tried to take another look at it, it seems that the link has been somehow corrupted, & when a fried tried to look at it on their Mac (as opposed to my PC) they got a strong warning not to open the link. Could it be that George has taken a dislike to having his secrets revealed & got it shut down already?